Once upon a time, on a hot summer day, a fox and a lion were sitting bored in the forest. Looking for something to do, they decided to terrorize their favorite target: the rabbit. Not wanting to attack him unprovoked, the two came up with an idea. “When he answers the door,” said the lion, “if he isn’t wearing a hat, we’ll ask ‘Why aren’t you wearing a hat?’ and punch him. If he is wearing one, then we’ll ask the opposite and punch him.” The lion and the fox decided that this was a good plan, and they headed to the rabbit’s house. When they knocked on the door, the unsuspecting rabbit answered, not wearing a hat. “Why aren’t you wearing a hat!? !” the two asked, and they punched him. Weeks later, the lion and fox were once again bored, looking for a way to entertain themselves. They decided that the rabbit was an easy target, but wanted a new reason to have their fun. “This time,” said the fox, “we can ask for cigarettes. If he gives us with a filter, we’ll say, ‘Why not without a filter?’ and punch him. If he gives us cigarettes without a filter, we’ll say, ‘Why not with a filter?’ and punch him.” So, the fox and the lion once again found themselves at the door of the rabbit’s house. They rang the door bell, and the rabbit soon answered. “Hello, do you have any cigarettes?” asked the lion. “Yes,” replied the rabbit, “but do you want them with a filter, or without?” In shock, the lion exclaimed, “Why aren’t you wearing a hat?!? !” and punched the rabbit. Moral of the story: it's always something. There certainly was something tonight as I waited for the bus to Ashdod. Two Israelis who spent the better part of their recent lives in Anytown, USA got married tonight, and several people from home came for the wedding. Over Shabbos, about 15 of us stayed in a nice, American-like (THANK G-D!) apartment in the Old City, which overlooked the Kosel (Western Wall). Tonight, since I left later than everyone else, I took the bus from the Central Bus Station in Jerusalem. As I went through security and began going up the stairs, waves of people made their way down, and I soon turned around to join the crowd. The reason for the exodus? A bag was left unattended on the third floor of the building, where tickets are sold and busses are boarded. In Israel, any unattended bag is treated as a possible bomb, and the appropriate measures are taken. After standing amongst throngs of angry Israelis for 45 minutes, they decided that the bag was not a bomb, and we were allowed to scramble in order to buy tickets and catch our rides. 1. Immediately after the ceremony, while still under the chuppah, the groom lit up a cigarette and began smoking. This went on while he was greeting all of the guests, many of whom were also smoking (and presumably had been throughout the ceremony), and took place indoors. Bottom line: Israel is like an ashtray, and anywhere that isn't innately flammable has hoards of smoking people. 2. The mechitza, usually used to separate men and women at religious weddings, was used to separate those people eating glatt kosher meals (more strictly supervised), and the rest of the people. This, in reality, meant separating the religious guests from the non-religious guests. 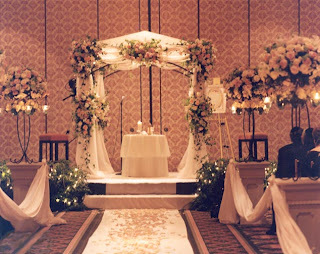 Because the bride and groom are marginally religious, and the groom's family is somewhat more religious, there were general religious courtesies. However, while Jews of Middle Eastern origin are very traditional, there is often a serious breakdown when it comes to translating that tradition into the meaningful religious observance that it generally follows. This meant that after the initial dancing to welcome the groom into the room (performed by men), the lights went out, strobe lights came on, and men and women in jeans and tube tops replaced black-frocked men, and Cher and other American music replaced traditional Jewish wedding music. Because of the mechitza and the location, the mixed dancing could not be seen by the religious tables. However, the venue was "kind enough" to place large movie screens around the room, each giving a live video feed of the dancing. Lovely. 3. Because the families are Moroccan, the wedding had an overt Arabic feel. 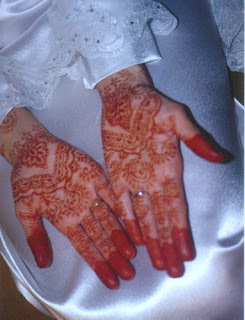 Sephardic weddings generally have a henna ceremony in the days preceding, and the women in the wedding party come to the ceremony with red smoosh in the palms of their hands. Also, during the initial dancing, and constantly throughout the night, the distinctly Arabic "LILILILILILILILILI" tongue-vibration-joyous-frightening noise could be heard from the old women. All in all, this weekend was very nice. It was nice seeing people from home, including many who live in and around Jerusalem. It was also nice to be together by such a simcha (joyous event). Israel continues to be inviting, with a new experience around every corner. Okay, 3:35 am, time for bed. The henna ceremony is done leading up to the wedding, not following the wedding. The high pitched ululations are found in cultures around the world, including Sephardic and Mizrahi communities in NON-Arabic lands and are NOT distinctively Arabic. I personally resent the characterization of the religiosity of Sephardi and Mizrahi Jews. Many are actually haredi. There seems to be a trend among many Ashkenazim to characterize Sephardi and Mizrahi Jews as irreligious, and while there certainly are many who are, let's not discount the vast majority of Ashkenzi Jews who are less religious or flat out unaffiliated and not religious at all. Try and be more fair and accurate. Who tied the irreligiosity of the families involved to them being Sephardi? The families happen to be Sephardi and happen to not be so religious. There is no connection between the two. Perhaps your oversensitivity to the issue led you to draw this conclusion.